In the year since they were introduced, SCDC has learned a lot about participation requests. Our new briefing summarises our learning so far. Participation requests are a way for people to have their say about what improvements they would like to see made to public services they use. Community groups in Scotland have been able to make them since April 2017, when they were introduced as part of the Community Empowerment (Scotland) Act. The briefing highlights that more information and support needs to be available to groups that want to make participation requests. The legislation and guidance may require some strengthening as well. 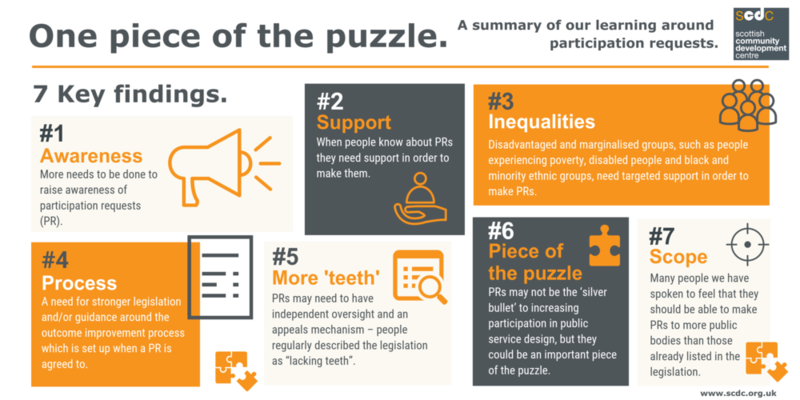 If this happens, participation requests have the potential to be an important piece of the puzzle in making bottom-up co-production happen in Scotland. Download the briefing to read more.